When a small army is needed, but the operation must remain covert, the President calls on The Team—a very special ensemble of Marines, Rangers, SEALs and CIA operatives who make up one of the most lethal fighting forces in the US arsenal. Enrique Antonio Vega runs one of the largest cocaine cartels in South America, deep in the rain forest of the Tri-Border region. With a tribe of cannibalistic Guarani Natives as his personal army, he operates with impunity. That is, until he takes part in the murder of the U.S. Ambassador. Having just returned from the Middle East where they foiled two large-scale terror attacks, The Team is retooled and sent to the jungle of the Tri-Border Region. 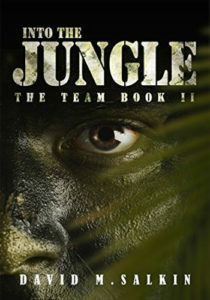 Their journey to the lair of Enrique Vega is perilous at every turn, and is the wild ride of The Team Book II, Into The Jungle.